Tonight some friends came over for a play with some new stamps from the new Stampin' Up! catalogue. 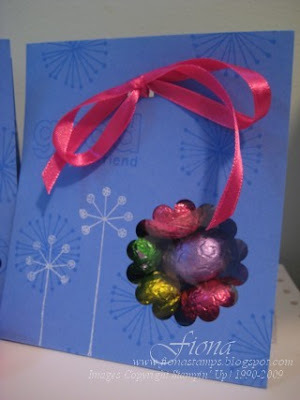 As a treat I made them a little easter egg pouch each, stamped with the new Good Friend set. I cut a piece of A4 card lengthwise down the middle at 10.4cm to make two long pieces of card. I then scored across each card at 12cm from each end, which makes 3 sections, the middle smallest one being the base. 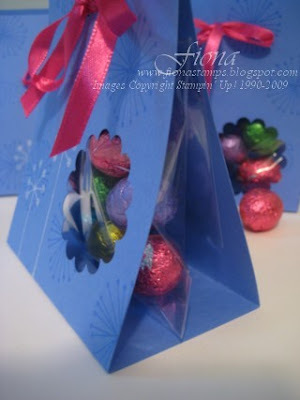 I stamped with Ballet Blue and Whisper White, and punched a peephole using the Scallop Circle punch. 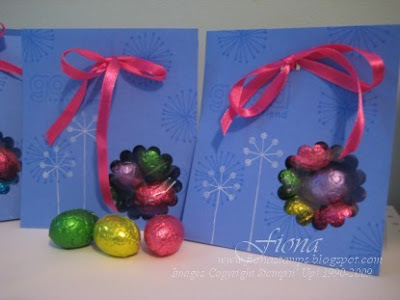 I popped the easter eggs into a cellophane bag, which I stapled to the inside back of the pouch. Then I used the double rectangle punch to punch holes on the front and back of the pouch, and threaded through some pink ribbon to secure. I've been trying lots of things with my new stamp sets I've pre-ordered, and will be posting them in the next few days, so stay tuned! There are some beautiful stamps in the new catalogue, and gorgeous scrapbooking papers. So much fun.